STARKVILLE — The dream season that was for the 2018 Mississippi State baseball team wasn’t much of one for Jared Liebelt. While the Bulldogs were pulling countless episodes of improbable heroics on the way to Omaha, Liebelt was along for the ride as a pitcher who dreaded the act of pitching. It was more than just the 13.15 ERA the junior righty allowed in his first season out of Waubonsee Community College (Sugar Grove, Illinois). It was the process that got him there: paralysis by analysis, unable to relax mentally and enjoy the act of pitching as he had in years prior. Liebelt had to find a way out of that mental rut. He had a spot with a team in the Minnesota Northwoods League, a collegiate wood-bat league, but instead he went home to more or less drop baseball completely. Time previously spent thinking about baseball and working on baseball was spent playing video games with friends. 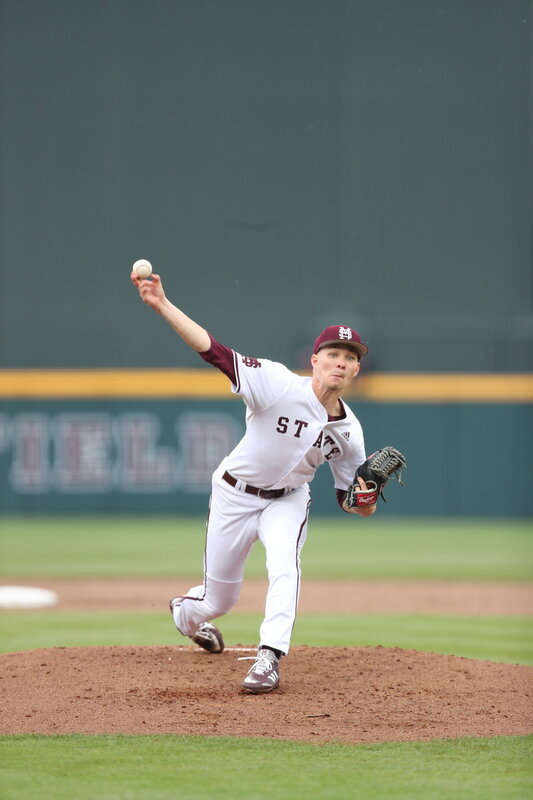 After months away from the game, Liebelt came back to Starkville and immediately established himself as one of MSU’s best relief pitchers. That’s what Liebelt has been through 38 games in 2019: 26.1 innings in 17 appearances with a 2.73 ERA and a WHIP of 0.949. The same man who hit as many batters as he struck out last season (seven) has now logged 15.2 innings against SEC teams with just four earned runs allowed (2.30 ERA). Liebelt’s secret to baseball success was coming face-to-face with life without baseball. It was near the end of last season — when Liebelt’s performance had more or less taken him out of the game, only pitching once after April 18 — that he diagnosed his issue. As his sophomore season at Wausonbee CC continued, MLB Draft attention came his way and scouts followed, he started pressuring himself to an extreme. He wasn’t playing the game to enjoy it; he went through every motion trying to impress someone. “It led to me putting a lot of pressure on myself, and then coming here where it’s a big environment, big history, huge expectations, in my mind, I put even more pressure on myself,” he said. “It was just a mental thing last year; physically, I don’t think anything changed, I didn’t change my mechanics at all. Liebelt had made peace with his results as a new coaching staff was evaluating them. His meeting with new head coach Chris Lemonis came with the news he was expecting — he was no longer on scholarship. Liebelt even told Lemonis he was not surprised. Liebelt asked Lemonis if he would have a spot to come back and make the team; Lemonis said yes. With that, Liebelt went back home to Aurora, Illinois, where he would rehab a minor knee injury to be 100 percent for the fall. In his first week or two back home, he assured his parents he wanted to return to Mississippi State — “If I’m going to play college baseball, that’s where I want to be at.” — and a call with assistant coach Jake Gautreau set the plan in motion. Liebelt knew he could call the hitting coach — the one holdover from the previous staff — for a straight answer. Liebelt told Gautreau he would understand if the new coaching staff wanted its hand-picked players in the fold and asked him a simple question: if I perform well in the fall, will I be on the team? Gautreau assured him he would, and assured him of his belief that Liebelt can return to that. From there, Liebelt went full-speed into the most casual offseason any college athlete has ever had. He played Xbox with friends. He would make the two-hour trip to St. Ambrose University in Iowa to see his girlfriend. He travelled to see family in Wisconsin. Occasionally he would play catch or workout with his friend Jake Smith, a pitcher for Madison College rehabbing from Tommy John, but it was for accompaniment with a friend more than the baseball activity. By resetting his mindset on the sport completely, he freed himself of the pressures of the next level. If the upcoming senior season were the last baseball he would ever play, he was prepared for that. When he returned to Starkville, mentally refreshed, he came upon a pitching coach with a perfect plan for him. The new pitching coach, Scott Foxhall, saw the numbers. He admits they were, “not pretty”; luckily for Liebelt, they aren’t the only stop Foxhall makes when he takes over a new staff. Next, he went to Liebelt’s video from the 2018 season, where he saw Liebelt’s arm slot: it’s low, almost low enough to be considered sidearm. Foxhall likes having right-handers with different arm slots, and that was a plus for Liebelt in Foxhall’s mind. The last step in that information-gathering process also helped. Liebelt came back to MSU in the fall with a fresh mind and did so to a pitching coach eager to find his potential. Then Liebelt, possibly unwittingly, gave Foxhall the keys to unlocking that potential. “One of the things with Jared’s personality is he’s very organized in his mind and he’s very routine-oriented, and he was not shy about telling me that,” Foxhall said. “We probably put together the most comprehensive routine for him than I did with anybody else on the staff. He wanted that and he followed it. There were a couple of times where it was raining, I called and he said, ‘I’ll find a way to get it in.’ He programmed himself, this is what I’m going to do every day. All the pieces came together pretty quickly in the fall. Foxhall started throwing him one inning at a time, testing his theory of Liebelt’s usefulness as a change-of-pace arm slot guy. In his experience, pitchers with lower arm slots recover quicker from outing to outing, so Liebelt pitched more frequently than most. Each one-inning outing built the coaching staff to its conclusion: Liebelt is far more than an odd arm slot guy. Of course the Brewers fan in Liebelt goes straight to Josh Hader. There are other examples of this role, brought to popularity by Andrew Miller in his postseason run with the Cleveland Indians: the role of the reliever used whenever the high-leverage situation presents itself. It bucks the trend of the closer, the best bullpen arm saved for the ninth inning; if a more important situation arises before then, why not go to the best arm? Liebelt’s usage has shades of that Hader/Miller role, even if it doesn’t have a traditional name. “I don’t think I really can define the role. I do remember him saying that he liked having defined roles. At the beginning of the year it was more I would be the seventh inning guy, Barlow or Colby (White) gets eight and (Cole Gordon) gets nine, but as the year progressed it’s kind of turned into whenever I’m most needed. It’s been a whole variety of different situations. One of his more popular roles is immediately following Ethan Small. Foxhall likes the difference in delivery with those two, forcing batters to go from Small’s overhand left-handed delivery to Liebelt’s nearly sidearm right-handed pitches. That one-inning change-of-pace is still used in those cases, but Liebelt has also finished games, gone long or both: he has three saves this year, two against SEC foes, and all of those saves spanned at least 2.2 innings. He closed the final 2.2 innings of the Florida win that clinched series and the final 3 innings of the rubber match at Tennessee. This is the product of Liebelt loving baseball again. The game consumes his life once more — this time in a good way, like it did when he was bursting onto the scene at Waubonsee, hitting 90 mph for the first time, then hitting 94 for the first time on the way to the JUCO World Series. The summer away from baseball has Liebelt in a good place if baseball ends for him when MSU’s season ends in June, but why would it? We’re halfway through the conference schedule and Mississippi State is tied for first. That means this team has something going for it, and we’ll discuss those pieces both here and on Dogpile, your favorite baseball podcast. His last four games, all of them starts: 4-for-10, 3 RBI, 2 homers, 4 walks. This production at the plate comes after only starting five times in the first seven weeks of the season — and still hitting .300 in inconsistent playing time. Furthermore, Gilbert is looking mighty comfortable at third base for a guy who has spent his MSU career as a catcher, simply keeping loose in the infield on batting practice ground balls. I did ask Chris Lemonis about Gilbert after the Sunday game and he said Gilbert has what it takes to be an everyday third baseman, yet he still expects some rotation there (Gunner Halter being the other guy) for matchup purposes. But later on, when I asked him about designated hitter and his personnel decisions there, he said he will roll with a hot hand when one presents itself. Gilbert could grow into that at third base given a couple more games. Let’s run through what MacNamee has done since March 1, shall we? - Rolled up a 12-game hit streak, multiple hits in seven of those games and six of the 20 hits in that streak going for extra bases. He drove in 13 runs in those 12 games. - The game in which that hit streak broke? He walked three times. He kept walking (currently leads the team 28 of them in 37 games) and put together another 10-game hitting streak, amassing a 28-game reached base streak. - More recently, he had at least one hit and at least RBI in all three games of the Alabama series. That’s all, just constantly reaching base, constantly hitting and doing so for six weeks. Casual. My hope is Plumlee’s days of being the forgotten man are over. His combined line in his last two SEC starts: 10.1 innings, 6 hits and 5 walks allowed, 1 earned run allowed (0.87 ERA), 5 strikeouts. He even covered those 10.1 innings in 142 pitches, so it’s not out of the question that his current effectiveness could go out to 7 innings if his pitch count is allowed to get up to the 90s. Ethan Small is undeniably awesome (a lot of talk about him on Dogpile, our baseball podcast, be on the lookout for that Monday afternoon) and JT Ginn sliding right back into the fold with ease gives this rotation the same 1-2 from before. But Plumlee being this rock solid as the current third option gives the Bulldogs a luxury that is beyond rare in college baseball. Right before both teams host MSU in consecutive weekends, these two play each other. Texas A&M is 9-5-1 with a manageable series at South Carolina before the Ole Miss series; the Rebels are 9-6 with Auburn in between them and hosting Texas A&M. This is especially true if Texas A&M takes the series with the Rebels, but in any case, this series should make the picture much more clear for MSU in terms of who its top competition in the SEC West will be. And that competition could be on tap for MSU right after this series, if the Aggies win it before hosting the Bulldogs. Given all but one team in the SEC West has a winning record in league play, it’s understandable that so much attention is being paid to the division, but Vanderbilt is far from out of this picture. Second in the SEC East right now behind Georgia, the Commodores actually have a pretty favorable draw to stack up some wins: at Alabama (4-11), Auburn (8-7), at South Carolina (4-11), Missouri (7-7-1) and at Kentucky (4-11) to finish. With that tame of a schedule and just a one-game deficit to Georgia, I won’t be surprised to see Vandy atop the SEC East and as MSU’s potential competition for the SEC regular season title. For me, spring football practice is like trying to get back in shape by playing some pickup basketball: it’s always good to do it every few months or so, just to sharpen the skill a little bit, but the real victory is to do it without getting hurt. If you can execute the motions a few times and live to tell the tale, you’ve done good. That doesn’t make the weeks of spring practice riveting television — for the most part. On occasion there are a couple of things that can happen in spring that might actually prove useful — in a sea of things that are mostly not useful. Let’s separate the two, shall we? Those of you that followed my Film Reviews on Twitter during football season probably saw much more interior offensive line play than you were anticipating, because that group was just so good last year. Losing two pieces from it (center Elgton Jenkins and right guard Deion Calhoun) is no small development, and these 15 practices in the new unit are big. They’re important for Darryl Williams, who is taking over at center and has a new set of responsibilities. They’re important for Stewart Reese, whose move to right guard is going to come with the expectation of no regression there, fair or not, because he is the veteran moving into that spot. Dareuan Parker also needs the time to playing alongside them — those guys have everything down mentally, and every rep he can get at their side to get up to their speed is a valuable one. It’s pretty common to see offensive line position battles extend a few weeks into fall camp, which does no favors for chemistry once they set that starting five. Things being as calm as they seem to be on that unit at the moment sure helps — it doesn’t guarantee reaching a ceiling that last year’s unit had, but it at least gives them a better chance than a unit that’s forced to come together in the final week of August. There are 110 days in between the Maroon & White Game and August 1, when we can reasonably expect fall camp to truly be up and running. For the most part, football players are on campus for most of those days, doing little more than working out with each other. That’s where you hear the stories of quarterbacks who are true leaders organizing their own 7-on-7 sessions, scheduling times to work with their receivers on routes, maybe see a private quarterback coach to work on their own footwork, etc. That being the case, spring is used for the development of offensive understanding — especially in MSU’s current situation, being Year Two under Joe Moorhead after Year One showed some offensive holes to address. Ultimately, these guys are going to be judged on if they can complete passes in September, not March and April. It may not give you much room for hot takes and Twitter nonsense/overreactions, and it’s impossible for us to evaluate now or even accurately project in the future, but it’s the truth. Deal with it as you please. This is one that makes this list because of how MSU is approaching this. Given what C.J. Morgan did late last year when thrown into the fire due to injury, it would’ve been easy to pull a plug-and-play here for Mark McLaurin and Johnathan Abram, simply finding an answer for the safety position Morgan isn’t playing and rolling with it. What MSU is actually doing is whatever it needs to do to get its best five defensive backs on the field. At the two safety positions, that currently means Marcus Murphy and Jaquarius Landrews, both of them having mostly played Nickel last year, at the safety positions. It’s a good move from an athleticism standpoint — and both of those players have the acumen to handle that kind of move well — now they just need as m much experience as they can get back there. The spring gave them a little, which is useful. In a year with such heavy transition on the interior of the defensive line, being strong up the middle at the second and third levels could be crucial, and seeing now Murphy and Landrews have a head start, if this is the final answer. Super Bulldog Weekend is upon us and Starkville will be flooded with people who are forced to make their trips to Starkville less regular than others. They’re coming to town at a time when the team is clearly good, but also containing a few interesting questions to answer with its recent daily lineup shuffling. Let’s run through those things, shall we? Jake Mangum is Mississippi State’s career hits leader and is on pace to become the SEC’s hits leader by the end of the month. He won the batting title as a freshman, had the best season of his career as a junior — and is still on pace to be better this year. The No. 1 spot is fine. Elijah MacNamee is on a 10-game hit streak and a 28-game reached base streak. He has twice as many multi-hit games (14) as he has hitless games (seven). The cleanup spot is fine. What happens in between them is where MSU is looking for stability. It’s probably going to be some combination of Jordan Westburg, Tanner Allen and Rowdey Jordan, but three different combinations were used in the Tennessee series. Up until now it’s been pretty self-explanatory based on which ones were hitting and which ones were not at the given time, but now there’s no telling what to do with Tanner Allen. Allen’s slump led to his bump down the lineup (which didn’t seem to help matters), but then they move him up in the lineup a day after going 0-for-4 just to see him deliver three hits and a homer. It would have been easy to have some Jordan-Westburg combo in those spots until Allen flashed some life up in the order. Admittedly, this is kind of a tame “problem,” if you even want to label it as such. It’s possible this is a controlled chaos situation, where the guys move where they belong based on recent production and do so all season, fluctuating back and forth comfortably; maybe the production eventually settles and they can fit one slot for the final six weeks. Really, it’s more of a convenience thing for the coaching staff. Finding something steady in those spots would surely make the day-to-day a little easier on everyone. There is obvious potential in Gunner Halter’s hit tool, but it’s simply not coming through right now: he’s got one hit in his last 16 at-bats, with seven of those 15 outs coming on strikeouts. This is the same guy that recognized defense as his weakness relative to his bat in the fall; thus, the bat is what has to keep him in the lineup every day. - Halter hits again. That’d be nice, wouldn’t it? This is the most attractive option for several reasons: it makes the bench deeper (it can’t be as deep if Halter is on it because he’s slumping), the double play combo of six weeks stays in tact and Foscue can stay at the position he’s played for his entire State career. - Foscue at 2nd and Marshall Gilbert at 3rd. This is nice because it gives a current .300 hitter (Gilbert) more ABs, after just 40 through MSU’s first 33 games. It also lessens the log jam at catcher and maybe you could use Halter as a pinch runner. It’s dependent on both moving parts being competent in their new positions, but it’s realistic, to say the least. - Landon Jordan takes over at second base. This one’s pretty clean, too: if he hits and he defends, all’s well that ends well. - Finally, let me work through this one. Say Josh Hatcher starts hitting well (at first as a DH), Tanner Allen gets going again and more struggles at second base prompt the switch: Allen from first to second, Hatcher in at first. First of all, how fun would it be to have Hatcher and Cumbest in the same lineup? To be clear, I think this option is unlikely, but it is one, and I think it’s the last realistic one. There may be some other ideas floating around out there in Crazy Fan Twitter, but this is the option that meets the line between unrealistic and possible. Bulldog designated hitters (and the pinch hitters in their place) went 1-for-10 against Tennessee, and it wasn’t for a lack of trying: those 10 ABs were spread through four guys. The options are exactly what you think they are: Hatcher, Cumbest, Landon Jordan, Hayden Jones and Gilbert (when he’s not playing third or catching). There’s a button to be pressed here to get this thing clicking, and this coaching staff has shown no hesitation in pressing buttons and changing things. The four Friday night starters MSU has faced — Florida’s Tommy Mace, Auburn’s Tanner Burns, LSU’s Zack Hess and Tennessee’s Garrett Stallings — have this combined line against the Bulldogs: 23.1 innings, 25 hits, nine walks (1.457 WHIP), 15 earned runs allowed (5.79 ERA). Keep in mind: even with those performances, two of them (Stallings and Burns) are still top 15 in the SEC in ERA. The Bulldogs are taking awesome pitchers and beating them up. Folks, this lefty just had his worst outing of the season and he still has the best ERA on the team among pitchers with at least 1 inning pitched. His ERA jumped by over a run and it’s still under 2.00. 23 strikeouts, 1 walk. If I saw that in a video game I would say it’s not realistic, and Barlow is doing it in the SEC. His seven appearances against SEC competition: 8.2 innings, seven hits, two earned runs allowed (2.08 ERA), no walks, 11 strikeouts. And with the two rough outings Jack Eagan had before he got back on track against Tennessee, Barlow was effectively the only lefty out of the pen. This guy deserves public acclaim for what he’s doing. After a series as disappointing as that one against LSU, there is going to be some groaning surrounding a team that had previously been dominant. That being the case, we’re going to address what is real and what is not, and we’re only doing two of each (as opposed to three of one and two of the other) just to be fair. Seven errors in a weekend just ain’t good. The team was already in the lower half of the SEC in fielding percentage (.970) going into that Saturday game in which it added three more errors; Vanderbilt had 15 errors all season entering Saturday, and MSU almost had half of that in three games. For a team with aspirations as high as this one’s, the defensive performance we saw this weekend — if sustained for any significant period of time — can prevent them from reaching those goals, and they know that. It’s likely to be a big emphasis for them going forward, but I’m stopping short of a full-on crisis, for reasons we’ll get into later in this post. That awesome opening weekend was quite the moment, but it’s a distant memory at this point. Since then he’s hit .211 and his doubles per at-bat pace in that span is slightly below what it was for his entire freshman season. It’s not like he’s disappeared entirely — he did have two hits with two RBI in the Southern Miss rubber match, plus 2-for-5 in both of the wins at Florida — but the large sample size is clearly not kind. One bad weekend does not make a bullpen bad. Yes, the entire pitching staff allowing 13 walks over the weekend and seeing the ERA climb nearly half a run (2.92 to 3.34) is not desirable, but even after that, the top four relievers in innings pitched (Jared Liebelt, Brandon Smith, Cole Gordon and Trysten Barlow, in that order) still have a combined ERA of 3.36 and a WHIP of 1.076. The numbers may not be as dominant as they once were, but they’re not objectively bad, either. If you take this weekend appearance by appearance, there were actually some good moments for the bullpen. Each of the Thursday relievers got MSU out of jams: Barlow inherited runners on first and second with no outs and retired three straight; Liebelt inherited the bases loaded with one out and ended the inning without allowing a run; Gordon came in after LSU scored three runs and recorded the final out of the inning to stop the bleeding. All of them were stretched beyond the initial heroics to results not as strong, but that’s kind of a no-win situation for a coach. If you ride the hot hand but they give up hits, you’re criticized for not going to someone new to start a fresh inning; if you give someone else the clean inning and they struggle, you’re criticized for taking a hot hand off the mound. Plus, all three of those guys have shown the ability to go more than three outs strong this season, so I still find the ideology to be strong. Now, I won’t pump sunshine forever. The next two opponents, Tennessee and Alabama, have team batting averages slightly worse than LSU’s — solely because LSU skyrocketed over the weekend. If runs continue pouring in against those two teams, then I’ll join in on the conversation of a subpar bullpen and what to do about it. But folks, the time for that conversation is not now. I’ve seen a lot of fans propose radical defensive shifts, personnel changes and both as ways to fix what the defense was this weekend, and I don’t think it’s quite time for that. Let’s go through some reasons why. First, this kind of weekend does happen to teams sometimes. 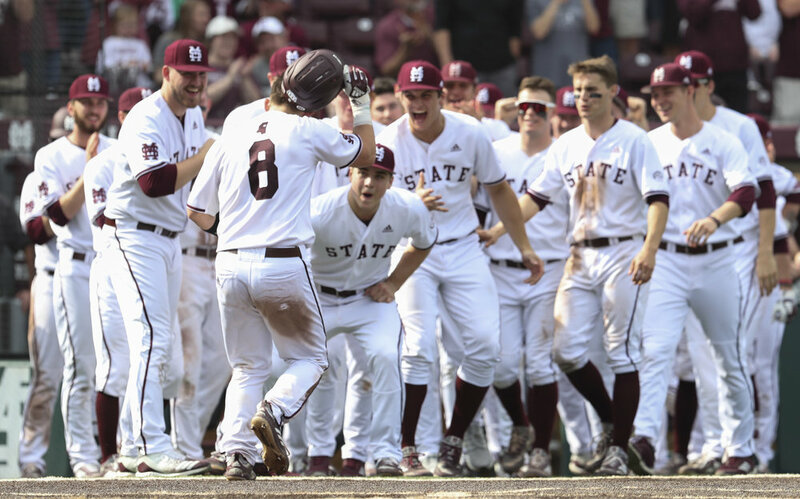 Last year’s Bulldogs committed eight errors in being swept by Vanderbilt, committed six in losing the series to Texas A&M and even committed six in the first three games of the Tallahassee Regional — you know, the regional they won on the way to Omaha. Other teams of similar excellence also had stretches like this. Texas committed four errors in a two-game set with Arkansas, Washington committed eight in a four-game stint with Illinois State and Arkansas committed seven in the three-game Tony Gwynn Classic; all three of those teams made it to Omaha. Most teams have stretches like this, so I think it’s important to make sure this is more than just that bad stretch before they smash the reset button on the entire lineup. The change I often see from fans on Twitter is getting Jordan Westburg out of shortstop in favor of Gunner Halter. Yeah, Westburg did not have a good weekend defensively, by his own admission, but hold your horses here folks. Halter said in the fall defense was not his strong suit, and frankly his defense at second base has not been as good as Hunter Stovall’s was. Yes, that’s probably an unfair standard to hold someone to, but if you’re going to unseat a shortstop for someone, wouldn’t you want them to exhibit that level of defense at their current position? Furthermore, not all of this is simply misplaying balls. Two plays stick out in my mind: the two run-ins Rowdey Jordan was involved in, one collision with Jake Mangum and the one where his glove and Westburg’s hit each other, causing the ball to come out. That’s not a skill or misalignment thing, that’s a communication thing, and that’s exactly what Westburg said after the game. That can be fixed without going through all the potential fallout of a reboot. If this kind of performance continues, then yes, there will be some moves that need to be made. Maybe my take of Tanner Allen providing more defensive value somewhere other than first base can finally be tested, among others. But I don’t think this weekend merits that yet. This needs to become more than a one weekend problem before it’s treated as a more than one weekend problem. It seemed pretty clear that the coaches saw something brewing for this dual-sport freshman, with 12 of his 17 at-bats coming since March 13. They wouldn’t have forced him into so many pinch-hit chances if they hadn’t, much less the Sunday start. But the way he’s produced (four hits against Auburn, two of them doubles) adds yet another interesting layer to what has been yearlong intrigue around the designated hitter role. Josh Hatcher was smoking people to take a hold of the DH spot, but Auburn is heavy on left-handed pitching and the left-handed Hatcher had the understandable matchup issue. In the Friday game, when Auburn got 7 innings from right-handed pitching, Hatcher got two hits; Saturday, Auburn’s first 4.1 innings came from leftys and Hatcher struck out twice. Sunday, Auburn had 5.1 innings thrown by leftys and the right-handed Cumbest gave them three hits and an RBI for their trouble. If Cumbest can continue to mash like this, especially against southpaws, then he makes himself a very attractive DH candidate to platoon with Hatcher. This development also makes it a pretty interesting conversation when you include the next guy. The junior catcher continues to hit, which of course is a good thing: six more hits in the Auburn series pushed his batting average up to .319, and his 17 RBI are already more than the 13 he had last year. But here’s what’s interesting about what Skelton did this weekend: he caught all three games. Skelton’s bat is too good to take out of the lineup, that much is obvious. It used to be easy to rest his legs by sticking him at DH, allowing Hayden Jones or Marshall Gilbert to take a game and get their respectable bats some ABs in the process. But now, with Hatcher and Cumbest hitting this well and Landon Jordan still on the bench, maybe that DH spot isn’t available. Is the only way for Skelton to be in the lineup daily to put his legs through the ringer and catch every single game? It may not stay this way for the duration, but I would argue it’s that way right now. There are countless advantages to having Friday and Saturday starters as good as Ethan Small and JT Ginn, but among them is little need for the bullpen on those days. That need is even smaller when MSU can turn to Jared Liebelt to fit whatever hole is necessary. In both of MSU’s SEC weekends so far, the Bulldogs have made Liebelt the first man out of the bullpen on Friday and Saturday. Both times, Liebelt went a short stint in the Friday game and took a longer stretch on Saturday, taking 26 and 25 pitches to cover 2.2 and 2 innings and finish wins. There’s a lot of reasons why this role is interesting and effective. First of all, it helps that Liebelt is getting the job done. The man’s got a 0.921 WHIP, he’s allowed two walks in 15.2 innings (think about that for a second) and his ERA over those two Saturday SEC outings is 1.93. It also helps that he’s able to take crucial innings in Friday and Saturday games because, let’s not forget, this bullpen is deep. The way Liebelt’s been going right now, guys such as Cole Gordon, Colby White, Brandon Smith and others can keep themselves available for Sunday, when MSU may need strong bullpen arms to win a rubber match. The trickle-down effect of Liebelt taking big chunks of innings on Friday and Saturday is significant, and if this is his role for the season, this bullpen has a chance to be epic if he continues performing like this. The young man from Auburn has made a habit of killing his hometown school, and reversing his own fortunes as he does it. Whoa, this is true. He entered last year’s Auburn series with a .191 batting average, went 3-for-8 against Auburn and ended the year hitting .321, leading an Omaha team in slugging. Then this year, Rowdey took a .167 batting average into the Auburn weekend and went 6-for-13 (.461). Rowdey Jordan had 11 hits in the team’s first 21 games. In his last 4 games, today’s ongoing game included? 7 hits. Rowdey Jordan’s career numbers against Auburn: 9-21 (.428), 8 RBI, four doubles. They have combined to cover 25.1 innings with a 3.20 ERA and they’ve been efficient as they do it: they’ve covered at least 6 innings in each of their outings and neither of them have seen a 100th pitch. Their strikeout-walk ratio against SEC competition is 35-7. They’re both top 10 in the SEC in batting average allowed (Small 7th, .154; Ginn 9th, .183) and innings pitched (Ginn T-4th, 38.1; Small 9th, 36). Small leads the league in strikeouts (58) and strikeouts looking (17); Ginn leads the league in wins (6). Vic Schaefer came to Mississippi State with no illusions, no desire to avoid the inevitable. “We knew what 13-17 was going to look like,” Schaefer said, referencing his first season in Starkville, the 2012-13 season. Schaefer did nothing to dodge that short-term fate. Instead, he installed a culture. The same culture that took the program from 13 wins to, by the end of Friday night, 13 (and counting) NCAA Tournament games over three seasons; the culture that has survived, if not fortified, as the program rose from inconsistent at best to constant Final Four threat. It is the Vic Schaefer culture that years ago appealed to players hungry to reverse a program’s fortunes, now appealing to the nation’s most well known talent with more offers than they can handle. It is the culture that has captivated Starkville and a Mississippi State community to thousands of people on a nightly basis, home or away. This is the tale of how that culture was built. “We have a saying: it’s not what we do, it’s how we do it that separates us from the rest of the country,” MSU assistant coach Johnnie Harris told Matt Wyatt Media. In the beginning, establishing that culture was far more important than immediate talent. Harris remembers the program starting by trying to find players that could be competitive in the SEC, but it didn’t have to be raw scorers. Some things were non-negotiable. That first class — Carter, Dillingham, Ketara Chapel, Breanna Richardson and Chinwe Okorie — was crucial in that regard. Schaefer put it simply, “We inherited a bunch of good kids, but the toughness was missing,” and he leaned on that class to install it. Dillingham and Richardson ended up becoming two of just 26 players to score 1,000 career points, but their most valuable work was installing the style and image Schaefer wanted to have. Yes, that means intense defense for the full 94 feet of the court. It means attention to detail on the offensive end and sacrifice everywhere, be it diving for loose balls or taking charges. But it also means thriving in a work environment that Schaefer realizes can grind down even the strongest of competitors. “I’m trying to pitch a perfect game, that’s who I am. And that’s not going to happen, by the way,” Schaefer said. “I’m trying to beat somebody something to nothing, that’s who I am. I’m trying to coach the perfect game, the perfect team every day. My staff, they work tirelessly in that same mentality. That first class had to learn to live in Schaefer’s world and how to embrace it, but also how to teach it. Therein lies one secret of how this culture has stood the test of time and significant program rise: coaches engrained it in the first class, and players have passed it down to each other ever since. That’s how Bre’Amber Scott learned it: she simply looked up to the seniors around her, knowing they were an example to follow, but their eyes would also be on her. When the culture is enforced by both coaches and players, it lasts the test of time and growth. As challenging as the way of life may be for players adopting it, it’s just as hard for coaches to find players who can live it. This is not 2012 Mississippi State anymore: those that become Bulldogs are not signing up to simply thrive in a challenging environment, they have to stand that test and come out of it as the best players in the nation. Recent performance suggests nothing but the nation’s best will satisfy program expectations. Finding the nation’s best players and those willing to live the Schaefer way is a small cross-section of people, and one that isn’t always easy to obtain. Schaefer sees a lot of what he calls the Jack It Judy mentality in his recruiting trips: highly-rated players who know they are primarily evaluated for their ability to jack up shots in bulk and make them, and therein lies their sole motivation. Scoring ability is important, and MSU requires it, but it takes more than that to earn a chance to become a Bulldog. “We recruit to a fit and the summer time is when you do your homework, when you’re out on the recruiting trail watching kids play and developing your list,” Schaefer said. “Not every kid can play our style, athletically, physically, can play our style of basketball. For us, those are the kinds of student-athletes that we have to go recruit. If this were a Venn diagram, the selection of players that can truly thrive in the Schaefer culture is a small one, but the intersection between that circle and the one for nationally elite players is a small target to hit. The recruiting records show MSU is hitting that small cross-section. According to the rankings from girlsbasketballreport.com, MSU’s 2013 and 2014 classes contained just four players ranked among the top 50 at their position and only four among the top 150 nationally regardless of position. Compare that Teaira McCowan and Andra Espinoza-Hunter, both ranked fifth their respective signing class, both top 50 regardless of position, and both living the Schaefer edict well. If the trend continues, the future could be even brighter: of the three freshmen on the roster (redshirt Myah Taylor, true freshmen Jessika Carter and Xaria Wiggins) and the five signed in the 2019 class, half of them are top 10 at their position and only one is outside of the top 25. All of them are inside the top 150 nationally, all but one inside the top 100. Schaefer is convinced there are enough of those prospects that, given his staff’s recruiting ability and the program’s prominence, “You don’t have to settle for one over the other,” being elite talent or aptitude for the Schaefer way. And yet, at MSU, their prospect search has an additional layer to it. From the moment these players set foot on campus, they are community icons. It’s something Schaefer and staff take seriously, much like the program’s on-court identity. So they leave it to the seniors to handle. “I think the culture we have created, the things we talk about, the things we show them and the situations we put them in allow them to buy into that mentality,” Harris said. “I don’t know that everybody that you recruit, I don’t know that they will show that or you will be able to see it. Some kids say they have it but maybe not so much. Once they get into it, they see our players doing it and seeing how our fans react, sometimes you can see a Teaira or a Jordan (Danberry), you see those kids on the court with long lines on the court every game, and sometimes it’s the same people wanting the same picture. It’s an all-around challenging way to live, but MSU doesn’t hide that from the players it is persuading to sign up. Schaefer is signing basketballs in his office as we talk. This sit-down comes early in the eight-day stretch where his team doesn’t know who its next opponent is, much less the days after that waiting to play them. The marker in his hand comes to an abrupt stop. A look of confusion takes over his face. I then explain to him that derecruiting is a term often used by football coaches, a term they’ve invented to describe the process of bringing their signees down to earth after a recruiting process that put them on a pedestal. These recruits have been told for months by dozens of coaching staffs that they are the best thing they’ve ever seen, then they get to campus and coaches have to convince them of their flaws and get their minds focused on developing them. Thus, derecruiting. Looking back on it, the fact that I had to define derecruiting for him probably answered my question. But he expanded on it anyway. Schaefer has alluded to that approach being used against him. After MSU 91-63 win over Tennessee on Feb. 10, he said he has heard of opposing schools using Schaefer’s ideology of high-intensity defense against him; seemingly trying to convince a group of shooters that they would have to learn to play defense for him, but wouldn’t be bogged down as such somewhere else. It’s done this way because it works. It’s done this way because this is the way that Schaefer used to create a juggernaut. It is the way Schaefer will use to try to win that last game. Butch and Clemmie Pierre got to spend a good bit of time in Nashville in early March. They first made the trip to watch Liberty, where their son Joe Pierre III is the Director of Player Development, beat Lipscomb to win the Atlantic Sun championship and a berth in the NCAA Tournament. A few days later, their other son, Mississippi State’s Video Coordinator Josh Pierre, was there for the Bulldogs’ run in the Southeastern Conference Tournament. At that point, it was evident both of their sons would be working for teams in the NCAA Tournament. These twins have split the family before — Joe graduated from Oklahoma State the same day Josh graduated from Arkansas State — but they couldn’t do this one. They decided to watch the two games at home. Then mere minutes into the Selection Sunday special, their twin sons were pitted against one another. That 2006 Final Four team was LSU, when Butch Pierre was an assistant for John Brady, bringing then teenage twins Joe III and Josh along for the ride. That run was ended in the national semifinals by UCLA, then coached by none other than Josh Pierre’s current boss, Ben Howland. It’s one of many instances of serendipity in the Pierre basketball story. Butch Pierre — Joe Pierre II given the nickname Butch by his grandmother — played for MSU from 1981-84 and remains top 10 in school history in career assists. The fact that Josh is about to conclude his first season working for Butch’s alma mater (and the place that began his coaching career) is a thrill for the entire family. That kind of coincidence has made the roads to Friday’s game both fun and bordering on surreal for the family. But they’ve also been necessary, as both sons have had to fight their way here. Joe was forced into this line of work early: he tore his ACL, LCL, PCL and meniscus in a freak knee injury, robbing him of his senior season in high school. While Josh played out that senior season, wearing his brother’s No. 11 as tribute, Joe III helped coach the junior varsity team and compiled scouting reports for his brother’s varsity team. Josh saw the beginnings of a solid coach right then and there. From there, Joe III was a student manager at Oklahoma State, where Butch was an assistant coach. Joe III’s path into the profession started at the high school level, where he was a student teacher at the junior high and assisting the Pawnee High School team in Oklahoma — until he was immediately catapulted to the NCAA Tournament. Joe III landed a graduate assistant job at Middle Tennessee — then coached by Kermit Davis, who shared a locker room with Butch Pierre at MSU and a coaching staff at LSU with him from 1997-2002 — and went to the NCAA Tournament in his first season there, where he was part of 15 MTSU taking down 2 Michigan State. While Joe III was working his way up at Oklahoma State, Josh was playing at Arkansas State for John Brady — the same head coach Butch worked for on LSU’s Final Four run in 2006. As a senior, Josh led the nation in walk-on minutes played per game all while establishing his own base in the family industry, taking all opportunities provided to sit in on coach film sessions, scouting report breakdowns and even timeout discussions. That Arkansas State experience proved to be the one he would follow for years, starting as a graduate assistant before moving up to director of operations. Like freshmen forwards Reggie Perry and Robert Woodard, Josh Pierre felt the call to return to the place that was home for his father. Somehow, all of those roads meet in San Jose for the first round of the NCAA Tournament. Joe III’s reaction to the news certainly suggests he thought the same thing. Find the young man on the third row, near the right aisle. He’s the one who remains seated, hands on his head clearly in shock as every player, coach, fan and support staffer around him stands and meets Liberty’s bid in the NCAA Tournament with unchecked enthusiasm. That man is Joe Pierre III, realizing he and his brother would realize a dream in the making for their entire lives. “We were excited, one, just to see each other. In this world of college basketball, we rarely get to see each other. I’m excited to see more than to play him,” Joe Pierre III said. “It’s one of those moments you dream of as a young coach’s kid. It’s something I think only God can orchestrate. There’s really no explanation for me. This is more than a dream for Josh, making his first appearance in the NCAA Tournament as something more than the assistant coach’s kid. This grants them the opportunity to do something greater. Joe III went out of his way to say the same. In all that this weekend will mean for the family, the platform for their faith is among their favorite aspects. Butch Pierre also appreciates the guarantee of it all. “For the first time, I’m winning either way it goes,” he joked. He said he and his wife will bring both Mississippi State and Liberty shirts, with him wearing one school while she wears the other and switching at halftime. Friday, the day of the game, is also Butch’s daughter/Joe III and Josh’s sister Langley’s birthday, so she’ll be in San Jose with the family. If Liberty is to advance, they could play for a spot in the Sweet 16 against Saint Louis and coach Travis Ford — the same man who coached Oklahoma State when Butch was an assistant there and Joe III was a student manager. It could also be Josh’s shot at the Sweet 16 in his first time in the tournament. Both brothers are open to the idea of sticking around San Jose to see their brother’s team in the second round — but even more open to being in that second round themselves. “If that’s what God has in the plan, for them to win, then I’ll support them in the next game, and I’m sure he will, too,” Josh said. As you can imagine, with an 18-2, 2-1 team coming home after taking a road series with a top 10 team, there’s going to be a lot of positivity in here. …since Mississippi State has seen power hitting like this to start a season. Of the 12 previous teams in this sample, none came within six doubles of the 54 by this year’s team through 20 games; 10 of them fell short of 40. The 21 home runs is also best since at least 2007, with five of the teams since 2007 producing fewer than 10 home runs by the 20-game mark. Slugging better than all of those teams is impressive when you consider the 2016 team ended opening weekend with 21 doubles and the 2013 team had a wild streak of a triple in six straight games. And remember those 21 home runs this year’s team has hit? That’s how many the 2012 team hit in the entire season; the 2014 team hit 16 all season. Here’s another way to look at it: let’s pretend Extra Bases are a statistic, in which a double gives you one extra base, a triple gives you two and a home run gives you three. This team through 20 games has produced 123 Extra Bases: only four of the teams since 2007 produced more than 100 in their first 20 games, but none of them can match this year’s 123. The average Extra Bases produced of the 2007-2018 teams is 81.3. However you look at it, this team has started with more power than any Bulldog team in over a decade. I wrote last year about how Mangum attributed a more narrow stance and being more patient to delivering more extra-base hits, and he’s keeping that going from his junior to senior season. One example: Mangum produced 16 extra-base hits as a freshman, the year he won the SEC batting title. Last year he had 22 doubles alone and is on pace for something like 27 this year, assuming MSU plays at least a dozen postseason games. Another way of looking at this is isolated power. It’s one of the more simple Sabermetric statistics: it’s slugging minus batting average. You can see what it’s trying to accomplish, it more or less boils down to the number of extra bases produced per at-bat. Jake Mangum’s isolated power from freshman year to the first 20 games of his senior year: .102, .061, .128, .141. It bears noting that all of this power is coming without much from Rowdey Jordan — last year’s leader in slugging percentage — or the second base position. I noted in last week’s Full Count that I still believe Jordan can be a productive hitter, so this isn’t waving the white flag on being this good without his usual form, but it is wild to think that he could find himself soon and this lineup could have even more pop. And on the second base thing: yes, that’s not normally a position for power hitting, but MSU has been spoiled by getting some of that from Hunter Stovall last year and would have gotten it the year before if not for his injuries. Chris Lemonis is clearly a seasoned vet when it comes to media as a head coach, and I learned that through something he said about the pitching staff. This staff has been living up to that simple formula. Think about this for a minute: the bullpen just covered 10 innings with a 0.800 WHIP — on the road against a top 10 team — and did it without Peyton Plumlee, the guy often mentioned in the aforementioned No. 3 starter debate. They can turn to Cole Gordon and Jared Liebelt for saves — and really can turn to Liebelt for anything. Jared Liebelt threw 13 innings last year: 13.15 ERA, 21 hits and 8 walks allowed. Jared Liebelt through 13.1 innings this year: 1.38 ERA, 9 hits and 2 walks allowed. This kind of turnaround is simply unbelievable. But they’re not limited to those options. They also had Spencer Price pitch the final inning of the third game in Gainesville, plus Riley Self got a late-game inning and Brandon Smith was thrown into a crucial situation earlier in that game. Chris Lemonis said he is a guy who likes to have bullpen pitchers placed into well-defined roles, but the way that group is going right now, he can probably pull names out of a hat and get the job done. There are a few good benchmarks throughout the season that give us good reason to take a look at the stats and draw some conclusions, and conference play starting this weekend is a good one. Here we go. Not only is the sophomore third baseman hitting the crap out of the baseball, but he’s also doing it with discipline: seven walks compared to six strikeouts. With four doubles and five home runs on 23 hits, 39.13 percent of his hits are going for extra bags. (For context, when Rowdey Jordan led last year’s team in slugging [.518], 37.1 percent of his hits went for extra bases.) When you factor in that he leads all Bulldogs with more than 50 at-bats in batting average (.359), he’s undeniably MSU’s most valuable hitter and its most consistent: he has yet to go more than back-to-back games without a RBI. Friends, that’s 40 strikeouts in 24 innings pitched. Fourteen hits and two walks allowed for a batting average allowed of .169 and a WHIP of 0.667. Best I can tell, the newcomer flamethrower has faced 24 batters: two of them got hits, one of them got hit by a pitch, none of them walked. Eight were retired in the field and 12 were struck out. That’s insane. There are a lot of really impressive numbers from freshman relievers, all of them earning those guys significant bullpen roles, but striking out guys at this rate is putting him in a serious conversation about the highest leverage roles in SEC weekends. Honorable mentions: Jordan Westburg has been hit with 5 pitches in 15 games after being hit by 4 pitches in 42 games last year….Three catchers have gotten at least 20 at-bats: Marshall Gilbert, Dustin Skelton and Hayden Jones. All of them are slugging over .500….Elijah MacNamee has already walked 11 times this year after walking 13 times last year. Florida’s starting rotation racks up strikeouts, its bullpen just went 10.1 weekend innings without allowing an earned run and is supported by a lineup that’s left the yard 19 times already, all while drawing nearly 5 walks per game. Auburn has taken weekend series with mid-major powers Georgia Southern and UCF, swept Cincinnati and UTSA all while compiling a team ERA of 2.15. LSU has Antoine Duplantis’ incredible slashline of .356/.409/.593, complete with 24 RBI, yet he only leads the team in one of the three slashline stats. Those are the three teams MSU starts the conference schedule with. MSU’s first three SEC opponents are ranked 5/18/13 by D1Baseball and 4/17/11 by Baseball America. All the things we think we know about this team but want to see tested over a stint of awesome competition? The first three weeks of SEC play will do exactly that. MSU’s most likely road to a top of the SEC finish puts a lot of pressure on April, because therein lies a rare opportunity to stack wins against SEC opponents. Of the four SEC teams D1Baseball and Baseball America both projected to miss regionals, MSU gets two of them in April: Alabama and Tennessee. Then there is a series against an admittedly strong Georgia team, but it comes at home. The series at Arkansas also that month will be tough, but I still believe MSU needs to stack up as many as 9 wins in April to give itself wiggle room in terms of finishing atop the SEC. That would mean more or less splitting the months of March and May would give MSU 18 SEC wins; that isn’t always enough to win a division but isolate one weekend in those two months, make it a very good one and maybe it is enough. GREENVILLE, South Carolina — Mississippi State’s No. 1 plan was thrown into doubt six minutes into the game, and the backup plan met the same fate eight minutes later. This was not the time to go to Plan C. This was the semifinals of the SEC Women’s Basketball Tournament and the subject of these plans was Missouri’s Sophie Cunningham, having earlier in the game set the new school record for career scoring and already scored 42 points in her first two games of the tournament. Plan C was ultimately the winning option. By all traditional measures, Cunningham was the only thing keeping the upset-minded Tigers in contention with Mississippi State: 33 points on 11-for-16 shooting, 5-for-9 from 3-point range, would be considered Herculean in most contexts. But in this one, MSU making Cunningham’s road to that production as difficult as it was, is what sent the Bulldogs to a fourth straight SEC Tournament championship game appearance with a 71-56 win. Plan B was Bre’Amber Scott, the more imposing and defensively adept of MSU’s two wing threats. She also picked up two fouls, hers coming before the midway point of the second quarter. Plan C was Anriel Howard. She did not relent her usual heavy workload offensively — 19 points and 10 rebounds, 50 percent from the field and 60 percent from 3-point range — and added the challenge of handling one of the conference’s most prolific scorers. She did it to rave reviews. Limiting shots is yet another Cunningham statistic that requires context. Yes, she attempted 16 shots, something she’s only done three times this year — one of them in the regular season meeting between the two, which Missouri won. But with Cunningham shooting 68.75 from the field and every other Tiger combining to shoot 33.3 percent (8-24), Missouri surely would have preferred Cunningham get more than 16 shots. But MSU prevented it the only way they knew how. Vic Schaefer thinks it’s possible the foul situation ended up being a good thing for MSU. Not only did it force Howard onto Cunningham and reveal her to be up to the challenge, but it also forced Cunningham to deal with three different body types and defending styles. Schaefer also believes the secret is the lack of production from every other player. No Tiger scored more than six points; no other Tiger starter scored more than three. Cunningham was responsible for 11 of Missouri’s 19 made shots, five of its nine made 3-pointers and six of its nine made free throws. They recognize Cunningham is the player who, as coaches say, is going to get theirs. The job is to make sure the supporting cast doesn’t beat you — and make life as hard as possible on that marquee scorer. MSU did both, and now it has a shot at the SEC Tournament championship that has eluded this program for four decades. The reception to last week’s random post of 3 things we know and 2 things we don’t was so positive — when combined with this helpful suggestion — has brought it back to be a weekly thing through baseball season. So each Monday I’ll do a full count: a set of 3 of one thing and a set of 2 on a different thing. Hopefully there’s a good balance of changing topics to keep things fresh but also making recurring topics of your favorites, so let me know if you have a favorite that I should consider making a recurring thing. JT Ginn is not the average high school kid, used to pitching in front of a few dozen people in high school games against the team down the street. He pitched for the USA Baseball U18 team and won a gold medal and he was in the Under Armour All-American Game. Of course there is a grandiose argument to be had about the early specialization of young athletes, whether it helps or hurts, but there’s one thing that it undeniably helps: mental composure. Once you’ve played in championship games with the letters U, S and A across your chest — and won the hardware at stake — you’re prepared for a lot. Ginn proved that when he threw 7 scoreless innings in front of 9,000-plus against Southern Miss; he proved it again in taking down a Texas Tech lineup that I believe to be SEC quality (although I admit they sure don’t look like it right now). He’s eventually going to have to pitch against LSU in Dudy Noble Field, plus in Oxford, College Station and Fayetteville — I haven’t mentioned Super Bulldog Weekend yet, have I? Ginn has shown enough to know if he fails, it won’t be the moment. He’s capable of bringing his good stuff when it’s needed most, and that’s half the battle. Beside watching him with my own two eyes and being perfectly able to draw that conclusion for myself, here are two numbers to support that claim. First: 19 innings this year, three walks but six wild pitches. That tells me he pounds the zone but does have the ability to mistime the occasional breaking ball and let it get away from him. When one carries that, they have to be able to hit the zone with the straight pitches, and Ginn certainly does that. - Texas A&M’s John Doxakis needed 196 pitches to cover 14 innings over his last two starts. Ginn? 172 to cover 14. - Vanderbilt’s Patrick Raby threw 94 pitches in 5.2 innings against Cal State Fullerton and 66 pitches in 4 innings against Pepperdine. - Tennessee’s Garrett Stallings has gone in between 7 and 8 innings in all three starts but has yet to do so in as few as 86 pitches, which Ginn has already done twice. Part of the excitement of landing a prospect like Ginn is the two-way ability, and trust me, I’m very much down with that. I’m in no way suggesting Ginn give up hitting, I just think he’s proven he doesn’t have to hit to be of significant value. This is a two-way street. Yes, a part of it is he’s so good pitching right now. But three guys got DH at-bats in two games in Frisco and there are at least two or three options beyond them, Ginn not included. Now, if all those guys fall flat at some point, Ginn becomes a more attractive option. But maybe this is a year that he keeps himself warm as a hitter, routine batting practice sessions and all that, and trains himself to compete for a semi-regular hitting spot in 2020. It’s not like MSU is always going to return almost all of the bats from an Omaha team. There will be opportunities for Ginn to hit, but it’s entirely possible this exact roster doesn’t require Ginn to hit to win. Yes, this Bulldog pitching staff is striking out batters at an incredible clip: 136 in 11 games, 12.3 per game. There is evidence to suggest this is something that hasn’t been done in as long as 15 years, maybe more. But strikeout numbers can, and will, change. We’ll dive into the incredible nature of striking out batters like this if they continue to do it a few weeks into SEC play. But one thing that in theory won’t change is walks: if you can hit the strike zone, you can hit the strike zone, period. This pitching staff is hitting the strike zone all the time. It has walked a total of 25 batters in 11 games — 2.27 per game. To prove that’s in elite company, it’s the best by a Bulldog bunch since the 2007 team walked 2.76 per game for the entire season. Of the 11 teams in between now and 2007, all but one of them were above 3.3 walks per game and five of them were above 3.75 walks per game. Considering the entire staff has a batting average allowed of .179 and they don’t allow walks….kind of a bleak picture for opposing lineups, isn’t it? - He’s now 61 hits shy of tying the SEC record for career hits, set by LSU’s Eddy Furniss in the mid 90’s. Based on his current average of .356 and his current pace of 4.09 at-bats per game, assuming he plays every game, he’ll reach that mark in the first game of the South Carolina series on May 16, the final series of the regular season. That date is cool with me because it’s a home game and that would be a great moment, but it’s also the first game after the final game of the Ole Miss series. And boy would it be poetic for him, famed Ole Miss killer, to break that record against them. - He is only 44 hits shy of tying the MSU career record, which currently belongs to Jeffrey Rea. Using the same pacing mechanism from earlier, he’ll reach that mark in the final game of the Arkansas series on April 20 — again, strange poetic justice around Ole Miss, as that’s the game before the Governor’s Cup game in Pearl. - Mangum is also tied for 5th in school history in career doubles with 54. He’s currently doubling once per 9 at-bats, meaning he would need an additional 153 at-bats to tie Travis Chapman’s record of 71. If he plays in every game and continues to average 4.09 at-bats per game, he’ll have no trouble recording 153 at-bats this year; now it’s on him to continue averaging a double per 9 at-bats, or at least something close to it so the postseason games can get him there. I was surprised by how much love there was for my Twitter thread of Mississippi State baseball players and their walkup/warmup music, so why wouldn’t we start there? Hello, Cody Perkins (@cody17perkins) — Who has the best walkout song one week into the season? Who had the best ever? This being my third year on the beat, I’m far under qualified to answer the greatest ever debate, but I can dive into recent history with the best of them. My passion for the fantastic saxophone riff in Elijah MacNamee’s walkup is well-established, so I don’t have to wax poetic about that. Thus, I think my answer is Gunner Halter: Grillz by Nelly. Y’all gotta remember, I’m 26 years old, I grew up around the turn of the millennium. Hearing that song was the best kind of a throwback, and I love Gunner for bringing that song back into my existence with each AB. Close runners-up include Marshall Gilbert (the epic drum riff from Phil Collins’ In The Air Tonight) and Cole Gordon (Immigrant Song/Led Zeppelin. From @dalemo830 — Are you disappointed MacNamee is sticking with alternating walkout songs instead of permanent sax? At first I was, no doubt. But upon realizing the song he chose, I grew to be OK with it. I think it’s the meaning/pun involved that makes it acceptable. If he were to simply take away from sax playings just to play another good song, I might be disappointed, but come on, it’s Return of the Mac as Mac returns to the plate. I can live with that. We’ve got a few more baseball questions, so let’s hit all of them at once, shall we? @lpchowdog saw something on Six Pack Speak about how balls just go deeper with the new Left Field Lofts and he was hoping I can add to the debate. To be honest, LPchowdog, it’s a little too early to tell. I need more data. Think of all the factors going into this. Temperature can play a particularly big factor here. Alignment, too: it’s easy to see how alignment can change depth. Plus, this early into the new stadium’s life, there just hasn’t been enough action in left field. I think we need more data to really study this thing. Does nine months sound like a fair timeline? Hello, New Dude (@CP_2) — What do you think about the HR light show? I don’t mind it. I’m sure it irks the baseball traditionalist crowd out there, but that’s not me. Here’s why: I like baseball, and I want it to continue being played generations from now. Any activity in society has to adapt to continue being played. Imagine if football never left the leather helmets: the deaths in the sport would’ve taken off, probably sometime in the 50s or 60s, and the game probably would’ve never reached the 90s as people realized it’s too deadly to continue on. Baseball has had to adapt countless times over the years, from the live ball era to ball park adaptations to financial structures and more. Sometimes those adaptations feel strange at the time, but the game would not continue on in future generations without them. If light shows after home runs and a little more freedom for celebration as a whole is what it takes to reinvigorate youth in baseball again, then I’m cool with it. And of course, always the most pressing question around the Bulldog baseball team. It comes from @MSULewis — Will State host a baseball regional? This weekend will be a solid measuring stick, if Mother Nature allows those games to happen. But I will say this: I find a few things about this crop of newcomers pretty convenient. I made this point on the episode of Dogpile, Matt Wyatt and I’s new baseball podcast, that we recorded earlier this morning, so find that in your platform of choice for the full description of it all. The short version is this team needed a second baseman, a few DH options, bullpen arms and more options at catcher and the newcomers have filled all voids. A team with no holes has a really good chance of getting through the SEC well enough to host a regional, and there is at least a chance that this team can live up to that. Now we wait for the season to tell us one way or the other. Ok, so we have a serious and intriguing women’s basketball question before a pair of nonsense questions to end it. Rob Montgomery, @10RobertWilliam, asks: What’s the simplest answer to explain why there has been so much parity at the top of women’s hoops? Elite players feel like they can compete for championships somewhere other than UConn and Tennessee. It took a while to prove that, but now it’s been proven, and thus the talent distribution is more wide. Take a look at the sport between 1995-2010, 16 years. UConn and Tennessee won 12 of those 16 titles. Four more times one of those two schools was the runner-up — and all four times it was Tennessee losing to UConn in the national title game. If you’re an elite prospect in women’s basketball for that long period of time, and competing for championships is a top priority (as it is for many), why would you seriously entertain anyone other than UConn or Tennessee? Since then, good coaches have built strong programs elsewhere and taken that monopoly apart (even with UConn winning four title in a row from ’13 to ’16). Baylor got going under Kim Mulkey; Vic Schaefer helped win a title at Texas A&M and now has Mississippi State at a similar level. We’re even seeing different programs in there now: Syracuse, Louisville, Stanford, they’ve all gotten to the highest level of the sport at times in recent history. It was more difficult to bring down a top team then because they had 90 percent of the top talent. That percentage has slid down now to the point that, in a given year, the top 10 prospects might spread themselves over six or seven schools, maybe more, as opposed to concentrating as many as possible within three or four. The same is even more true in the second tier of talent, and that’s why top teams fall more often these days: it’s infinitely more likely for them to face teams with an at least comparable talent level than it was even 10 years ago. (rap horn) NONSENSE TIME. @sbcmortgageman — If you could pick any number between 1 and say, 69, which number would you choose? What a nice range of numbers that is. Random selection is such a beautiful thing sometimes, isn’t it? And finally, from @BearionLedger — Ever thought of starting a newspaper? P.S. I want my own column. I have my own newspaper, sir. It’s called the Hudson Report here on mattwyattmedia.com. It’s a digital newspaper that publishes randomly. The delivery people hate this system, but at least they’re all allowed to make side hustles as Uber drivers. While I mull over your pitch of a column on this fine home for journalism, allow me to write a headline for this Mailbag and check it twice. Former Mississippi State superfan Steven “Stingray” Ray has filed a civil lawsuit against Barstool for negligence, invasion of privacy and wantonness, defined as a disposition to willingly inflict pain and suffering on others. The suit was filed in Tuscaloosa Circuit Court on Feb. 15. No lawyer is listed as representing Ray. The suit also lists WorldStarHipHop as a defendant. Ray became an internet figure in the Mississippi State athletics community for his opinions and rants on the teams, to the point that he was invited on an episode of the Comedy Central show Tosh.0 for what it called a Web Redemption. The Twitter account, @stevenray28, has since been suspended, but only after Ray publicly denounced his MSU fandom, crediting treatment by the fan base at large. He was photographed in Southern Miss and Ole Miss apparel in the fall. The lawsuit also states Ray is, “entitled to recover against the defendants for injuries, damages and losses proximately caused by their publication as set forth in the Complaint.” It states Ray is entitled to Punitive Damages that are not exactly defined in the complaint. Chris Lemonis sees the most value in Kyle Cheesebrough when he looks over and sees Cheesebrough fuming mad about something that isn’t immediately clear. It’s happened more than once, and it’s exactly what Lemonis wants from Cheesebrough. Lemonis wants that specific set of eyes trained on the craft that he honed for years as a player and spent more years teaching others to practice: catching. Cheesebrough may be listed as Mississippi State’s baseball camps coordinator/volunteer assistant coach, but in the practical sense, he is MSU’s catching coach. It’s a rare commodity to have — colleges can only have two full-time assistants and one volunteer, and with one assistant coach dedicated to pitching, it’s unlikely to have a former catcher on staff. But Cheesebrough is just that, and all involved expect that experience to pay off for MSU catchers. The same can be said for the weeks leading up to Friday’s season opener against Youngstown State. Not only does Cheesebrough know catching, but he knows catching for Lemonis, having played for him when he was an assistant at Louisville. Coaching was always Cheesebrough’s goal — he’s the son of a high school football coach — and all of his coaches at Louisville knew it. He landed a spot on the Louisville staff for three years, alongside Lemonis, and then followed Lemonis to Indiana. Cheesebrough was an assistant for Lemonis for all four years at Indiana and followed him to take the same set of responsibilities at MSU. This is Cheesebrough’s calling: using all of his catching experience to develop young catchers. “Catching is what I’ve done my entire life,” Cheesebrough told Matt Wyatt Media. “I’ve done it. I have the experiences of what they’ve gone through. I’m not some guy just throwing balls at you or throwing dirt balls at you, I’ve been there, I know what you’re going through. All told, Cheesebrough wants to develop his catchers to become good professional prospects. They won’t be asked to do so at MSU, but he’d like for them to develop mentally to the point that they can call their own games. If any one player takes over and becomes the all-knowing veteran, Cheesebrough is not above incorporating that player into the pitch calling conversation. Therein lies Cheesebrough’s ultimate goal for his catchers. He wants them to have a mental command of the game, then develop the confidence to let that command be known. “I want to see our guys see the game as I see it. There are so many things — when a guy’s going to steal, when there might be a bunt — they have to see those things coming,” Cheesebrough said. “I guess expecting the game and what’s about to happen. When you have a mature guy and they understand that, they can put on their own bunt defense or they know the call I’m about to be making. Skelton recognizes he was not an excellent defensive catcher early in his career, but feels much better about that part of his game going into this season and credits Cheesebrough for that. Skelton thinks he is a better thrower to all three bags and notices the blocking and receiving work Cheesebrough gets them while maintaining their bodies. Cheesebrough’s subjects will need to feel good physically in order to live under his microscope. As MSU’s practical catching coach, he sees the game through that lens. If a catcher doesn’t block a ball that allows a runner to go to second, then the pitcher throws a bad fastball hit for a RBI single, many would blame the pitcher; Cheesebrough will blame the catcher. In his mind, if his catcher had blocked that ball and stopped the scoring runner at third, maybe the pitcher gets back on track and retires the inning, preventing the run. It’s a high standard, but it’s the one Lemonis wants Cheesebrough to hold. Cheesebrough said they like to call themselves Catching U with their run of success at the position, and Cheesebrough was brought to MSU to make that more than internal tagline. This week’s Mailbag is going to follow a pretty straightforward trajectory. Two serious sports questions, one sports question that I found fun and then usual nonsense. I think y’all will enjoy it. Let’s get started with TJ Hand (@wh0dathunkit) — Is Teaira McCowan the No. 1 pick in the draft? This is going to come down to the age-old question that has plagued professional franchises for years. What to do with a premium draft pick: best available or biggest need? The Las Vegas Aces — the owner of the first pick — had to lean on A’ja Wilson more or less exclusively for their rebounding. She averaged 8 per game as a rookie and no other Ace had as many as 5.5. The Aces could also use more defense (fourth-worst field goal percentage allowed last year) and we all know McCowan can provide that. But when I look around the WNBA mock draft world, I see people drooling over Oregon’s Sabrina Ionescu, her run of triple doubles and her ability to do so many things. Of course if she chooses to return to Oregon for her senior season, all of this is different and the decision gets a lot easier. But even if Ionescu isn’t on the board, there is the volume scorer at Louisville, Asia Durr, that is also highly rated. The good news for McCowan is this projects to be a good draft for post players and she is undoubtedly the best of them, so if a big goes first it will be her. Now beauty is in the eye of the Las Vegas Aces. Daniel Montgomery (@dalemo830), as always, is bringing heat. More of a dynasty — Bama or the Patriots? The tale of the tape: Patriots have 6 titles in 18 years, Alabama has 5 in 10. Yes, at the moment the Patriots are running 3 out of 5 and are the reigning champs, combined with Alabama potentially having a reckoning named Clemson, but give Alabama credit for also going 3 out of 4 in 2009, 2011 and ’12. But the real reason I’m taking Alabama is because I think it’s harder to do this in college football than it is in the NFL. The Patriots have benefitted from having Bill Belichick and Tom Brady heavily involved in every bit of their success. In the NFL you can keep players for 10+ years and win several titles with them; in college you lose 20 percent of your roster every year, plus there’s more coaching changes in the college game than there are in the NFL. So not only has Nick Saban managed that turnover and stayed on top, he’s done it in a sport that’s radically changing. For a solid decade or two now, football innovation has occurred at the college level, and Saban has solved it as he went. That’s more impressive than the Patriots winning a much more static league with the same group of key people, to me. Now watch Clemson go win two of the next three national titles and make all of that invalid. This is interesting, from Rob Montgomery (@10RobertWilliam) — Based on my recent memory, it feels like State plays Ole Miss in men’s basketball far more often on Saturdays than on weekdays. I’m sure there are outliers, but both of this year’s matchups were on Saturdays. Is this something the SEC seeks to do to draw bigger crowds? Or is it pure coincidence? So I went into the schedules expecting this theory to hold up, that the SEC grants weekend slots to games it anticipates could draw big crowds. And yet, I was wrong. It seems the recent run of Ole Miss-Mississippi State Saturday games (four in a row now) is a coincidence. I looked at the Alabama-Auburn games, and there is no weekend bias with those — both of last year’s games were midweek games. I did the same for Tennessee-Vanderbilt and found the same thing. While it would make sense to manufacture some weekend games here and there for capacity crowds, I can also see how setting such parameters might make it more difficult to have the relatively random scheduling model that’s currently used in the divisionless SEC men’s basketball. As we move into nonsense, there are three straight questions that get into food, and I’m writing this while my wife goes to Chick Fil A for breakfast, so I’m clearly in the mood. @Wesley_Johnson — What’s on your Mount Rushmore of Left Field Lounge foods? In no particular order. 1) A well-cooked sausage dog. Or really any kind of hot dog that is not actually a hot dog: braut, sausage dog, chicken sausage dog, whatever. 2) A good smoked meats BBQ sandwich. Brisket, pulled pork, chicken, whatever. You do you, friend. 3) Can’t go wrong with a good bacon cheeseburger. 4) I’m a sucker for a good queso. It may not be traditional baseball food, but if you’ve got a crock pot situation in your lounge and you’ve got a good queso going, guarantee I’m going to partake. @flintstone_94 — What is truly the best thing since sliced bread? I need to know. On-demand entertainment. Remember when we were slaves to the content of the TV guide? Or for audio content, slaves to how our schedule combined with that of the radio host’s? I don’t want to live in those days, friends. I love listening to podcasts, where I can get my college football, college basketball, golf, baseball or whatever fix exactly when I want it, not when I get lucky in my daily commute. I love getting to watch my favorite shows when I have the time, not when the TV folks say I have to watch them. And don’t get my started on Netflix. A multi-parter from @ReeceMonroe1226. 1) What would be your baseball/wrestling walkout song? 2) Best sauce to put on wings? 3) I have a history exam Thursday at 8 a.m. and the men plays LSU at 8 p.m. Wednesday. Advice? 1) I’m not a wrestling guy anymore, so I’m going to take this as a baseball player. And here’s my problem — I would definitely be that guy that changes his walkup song every couple of weeks or so. There isn’t a superstitious bone in my body, so I would have no problem changing my walkup song in a hit streak and no slump would make me change one that I’m vibing with. I would probably cycle through a good bit of J. Cole and G-Eazy and go from there. 2) A well-done BBQ is hard to beat, for me. My wife recently made a maple buffalo wing that was quite good, but a good honey BBQ is always going to sing to my soul. 3) Well I hope you went, because it was a fun environment. (The overtime doesn’t help, though. I feel like the University should give a free coffee to every student that stayed to the end of that game and made it a 9 a.m. or earlier class. @CalebGarnerMSU If one GIF could sum up your life, what would it be? Is any explanation really needed? A theme of Mississippi State’s drop from 2-2 to 3-4 in Southeastern Conference play has been the inability to shoot well away from Humphrey Coliseum. To a certain extent, that is an occupational hazard — shooting well on the road is more difficult than shooting at home, and that combined with other perils of the road is the reason most Power 5 teams avoid more than one true road game before league play. The reasons for shooting woes on the road are obvious — hostile and uncomfortable environment, unfamiliar backdrop for shooters, etc. — but MSU’s recent woes have come with even more nuance. Joel Coleman of The Starkville Daily News found MSU is shooting 23.1 percent from 3-point range when forced to play with a Nike basketball on the road, but 41.5 percent when at home with its usual Wilson ball. MSU coach Ben Howland played down the impact of the ball. One thing that cannot be downplayed, however, is MSU’s shooting penalty by playing away from Humphrey Coliseum is more severe than that of its SEC brethren. Unfortunately for the Bulldogs, focusing the numbers on 3-point shooting makes it even worse. No team in the SEC struggles to shoot the 3-pointer away in road games like MSU does. A closer look at MSU’s road schedule reveals the Bulldogs have had as good a chance as any to shoot the 3-pointer well on the road. MSU’s road games have been against Dayton (170th in 3-point shooting defense), South Carolina (262nd), Vanderbilt (73rd), Kentucky (267th) and Alabama (119th). Getting right against the Rebels is certainly possible — they rank 238th in 3-point defense and have just the 10th-best defense in the SEC according to KenPom. But the time to do it is now. KenPom currently projects MSU to lose at Ole Miss and ultimately go 9-9 in league play, but that projection comes with a catch: two of those projected wins are on the road, at Arkansas on Feb. 16 and at Georgia on Feb. 20. Road shooting performances like this one could make one of those feasible road wins slip away, a loss that could cost MSU a seed line come Selection Sunday, or even worse. Folks, I am absolutely thrilled to have this back. I love it because y’all are generally good at giving me some nonsense to have some fun with, but sometimes y’all ask legitimate sports questions that I’m not thinking of in that exact way. 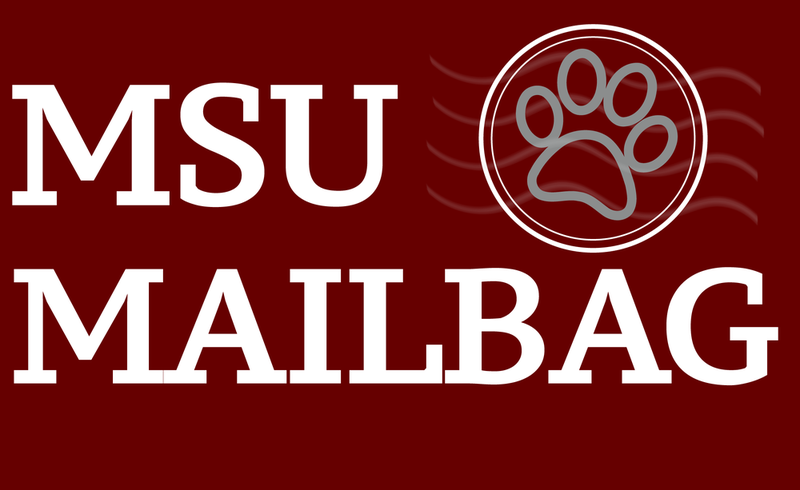 But let’s be real with one another: the Mailbag is known for its nonsense, and that’s where we’ll start. - And we’ll start with the king of Mississippi State-related nonsense: @cristilmethod. How much of Nick Saban do you believe Alabama has already replaced with advanced synthetic technology and do you think they have a long-term strategy to make him immortal? See, I think of this the other way around. I think Nick Saban is already a form of highly advanced technology and he is getting Alabama to turn those around him into similarly incredible technology. Look at all the coaching turnover recently. Alabama has lost both coordinators in each of the last two seasons and countless assistants in that time, too. Why? Programming errors. Alabama didn’t quite calibrate it right, which is why Alabama got blown out in the championship game and why those coaches have since been replaced. Now think back to the early part of this decade, when the University of Alabama started making bigger investments in its engineering department, creating better facilities for those folks. Coincidence? I think not! As to Saban’s potential immortality: the man is 67, looks like he’s 55, works like he’s 25 and does it all with at least one grandchild running around. Frankly, I can’t prove that he isn’t immortal already. - We actually have a lot of sports questions to get to, but we have another Alabama-related question so let’s do that now. Heath (@Dhmorrison7) asks — Is it true that Alabama has hired Bully to be their new mascot and will play Don’t Stop Believin’ at the beginning of the fourth quarter? Yes, Alabama has taken a lot from Mississippi State recently, but they won’t take Bully, and here’s why. Allow me to quote Alabama’s fight song: “Go teach the Bulldogs to behave, send the Yellow Jackets to a watery grave.” This puts the Crimson Tide squarely in the market of dog obedience training that includes an aquatic element. Bully doesn’t need either, because he’s obviously a good boy who has mastered walking on an underwater treadmill. Alabama will be taking their Bulldog business elsewhere. - Alright, let’s do some real sports talk here. Patrick Bell (@PBell97) — After Coach Huff’s leaving, you think we have any chance at all of landing Jerrion Ealy? As much as I’m not a fan of it, departing position coaches do make an impact on recruiting decisions. It’s just the reality of it. But I will say this: coaches and programs are very good at selling what they have and making recruits forget about what they don’t have. So I’m sure when MSU is putting the full court press on Ealy, they make sure his mind isn’t on Huff and is on his replacement (Terry Richardson). But, this isn’t the usual departing assistant coach. This is an assistant coach leaving for a conference foe and a conference foe that just so happens to be recruiting Ealy. Yet, there’s another catch with his recruitment, and this one benefits MSU: baseball. I’m not going to pretend to have any inside information on how baseball — college or pro — is factoring into his decision, and I imagine almost everyone that is trying to make people think they have that information is misleading you. I believe it to be this simple: pro baseball hurts everyone at the college level, college baseball helps schools such as MSU and not so much on college baseball helps schools such as Alabama. This puts MSU fans in kind of a tough place where you’re rooting for baseball with Ealy but not so much so that he gets the big MLB Draft money, but that’s the situation you’re in. That’s why I think however baseball ultimately plays into this is far more important than any one assistant coach. - A brief note on a similar subject before we go forward, in the form of a question from @PrestonCoats — With 4 position coaches leaving after year 1 of the Joe Moorhead era, what kind of message do you think this sends recruits/current players? I think the hires Moorhead makes and how they perform will send the real message. First of all, I think time will be kind to these departures. Let’s break these down one by one. Mark Hudspeth — a man with 14 seasons of head-coaching experience — left to be a head coach. Luke Getsy, having spent the last four years in the NFL, returned to it and to the franchise he spent those four years working for. Brian Baker and Charles Huff joined one of two programs that has had a shot at the national title every single year over the last five years, and specifically for Huff, a school that generates head-coaching candidates like crazy. Everything in there makes complete sense, right? Of course there are underlying details that paint a less flattering picture, but those details are just as plausible as the explanations above. It’s possible that those things prove to be the reality in the years ahead. Ultimately, Moorhead put the standard on himself of taking the program from good to great. He’s going to have to do that with the people he hires, and therein lies the real message to recruits and players. - We’ll come back to a couple of Mississippi State questions after a couple of bigger sports ones. First, from @Wesley_Johnson — As sports commissioner, how would you change the rules to let athletes celebrate or taunt opponents? Maybe this says more about my athletic demeanor than anything else, but for the most part, I believe if you want the person to not celebrate then you should not give the person something to celebrate. If somebody does an annoying home run trot, well, you can save yourself from seeing it in person by not allowing a home run. With that in mind, here’s the proposal: all celebrations are allowed as long as they don’t involve the celebrating team making contact with the opponent. So you can say or do whatever you want, you just can’t shove an opponent or do something dangerous, etc. Ultimately this thing will normalize because all these players want to do is have fun, anyway, and if they do anything in their celebration that negatively impacts winning, their coaches will take care of it. This environment seems pretty conducive to fun celebrations to me. - And another from Rob Montgomery, @10RobertWilliam — Who’s your pick for the Super Bowl? What’s the first Super Bowl you remember watching? Root for these bunch of Patriots? Never. Plus the Rams are one of very few teams in this league actually attempting to do unique things, and we need to encourage all forms of innovation that we can get from the NFL. Go Rams. The first Super Bowl I remember is Super Bowl XXXVI (Feb. 2002), the Patriots against the Rams. The upstart, rag-tag bunch of Patriots up against The Greatest Show on Turf. I remember thinking the game would be a blowout. If only I knew what the ensuing 15 years would hold. - What we’re doing from here: One MSU sports question and two about me. @cnb0745 has a simple but brutally difficult question— Best Football player in Mississippi State history? Jace Christmann. Need I go further? I’m going to give Dak a slight edge over Johnie Cooks. Maybe it’s recency bias, maybe it’s quarterback bias, who knows. I just feel like Dak accomplished more than Cooks did. - Alright, two on the personal note. First from @BearionLedger — Are you a fan of any school? Sad but true, you kind of have to give that up in this profession. Unless you’re in a position like this one as a North Dakota State grad, thus it’s almost certain your favorite school and the school you cover won’t intertwine, you have to give that up. Especially for me — I’m an Alabama grad. I do maintain my fanhood in Atlanta United, the Oakland A’s and the Nashville Predators, and I’m starting to get into Premier League with Tottenham Hotspur and Newcastle. I do, however, find myself following along teams that I find incredibly fun, so there’s an element of fanhood there. I loved following Hawaii early in the football season, and who didn’t root for Purdue after they trounced Ohio State? - And finally, from @Bryce_Bean — What’s next for Matt Wyatt Media? Will we get film review for other sports? That last part is certainly an option, actually something Matt and I have been discussing some over the last couple of days. This that you’re reading is a little glimpse into the future of Matt Wyatt Media — the written word. It’s not something Matt has had before and it’s something that we will have. What we’re going for is high-impact when we do write, and we’ve got some stuff in the works that will be just that. Many of you have also noticed the new podcast — Praise The Lord & Talk ‘Dogs — on the women’s basketball team, and more podcasting stuff is on the way. And yes, the video thing is where more manpower can be really helpful. Matt’s a busy man of his own accord, and the video projects that he is known for are not easy. They take a lot of time and energy, and it’s a lot for one man to handle. Now he has two on it, and one that is in Starkville — thus close to Mississippi State — and can create opportunities that way. In the immediate future, it means more in-depth coverage of the women’s basketball team through Praise The Lord & Talk ‘Dogs. Going a little beyond that, there’s a baseball season and football spring practice to handle. And Matt Wyatt Media currently has double the workforce it has ever had, so you can expect a workload that reflects that.